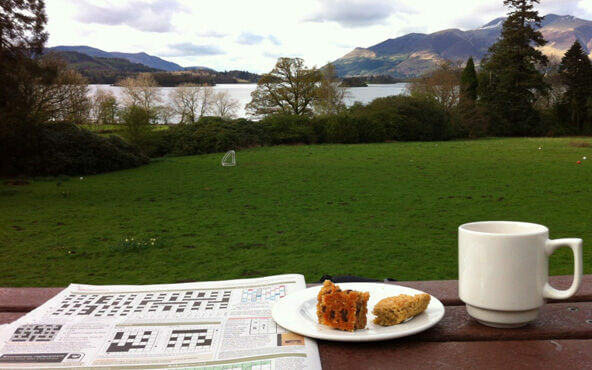 Here are our Ten Top Tips for Days Out from DERWENTWATER INDEPENDENT HOSTEL show on the Independent Hostel Guides map of Lake district hostels. Days out 1. Walk up by the waterfall in the hostel grounds to Ashness Bridge, Surprise View, Watendlath and Rosthwaite for a great walk to introduce you to this special part of the Lake District. Guaranteed wonderful views and tea shops and you can catch the double decker open top bus back along the Borrowdale valley. Days out 2. Have a ride on the Keswick Launch around beautiful Derwent Water – the complete circuit takes 50 minutes or combine a boat trip with another walk – Cat Bells is a very rewarding smaller mountain – a first mountain summit for many young children. Days out 3. Discover Keswick – a great little town with plenty of attractions including the new King Kong Climbing Wall, refurbished Keswick Museum and the famous Pencil Museum. Keswick has many different festivals during the year so there are often special events in the area. Days out 4. Try some watersports on the Lake – hire a kayak or a canoe and explore some of the islands on Derwent Water or take a rowing boat from Keswick – you’ll be rewarded with different views. Days out 5. Have a day out at Whinlatter Forest to enjoy the forest trails or the excellent mountain bike routes. The children’s play area is highly recommended. Days out 6. Visit Honister Mine, spectacularly located at the summit of Honister Pass. The brilliant Mine Tours will give you a fascinating insight into the mine’s history. Plenty of exciting activities on offer from the ‘Extreme Via Ferrata’ to ‘Climb the Mine’. Days out 7. Further afield, we can highly recommend a visit to Mire House, Wordsworth’s House at Cockermouth and the Wordsworth Trust (Dove Cottage) at Grasmere. Days out 8. Take to short mountain walk up Latrigg, Walla Crag from the hostel grounds. Days out 9. Walk three of the highest Lake District mountains – Skiddaw overlooking Keswick , Scafell and Scafell Pike at the head of the Borrowdale Valley.